Advanced Viticulture, Inc. is a full-service vineyard management and winegrowing consulting company that operates from a standpoint of sustainability. From a philosophy of minimal inputs to the vineyard, we achieve environmental protection while allowing each sites uniqueness to be expressed in their wines. Reduction of pesticide, fertilizer and irrigation inputs allows the vineyard's characteristics to shine through to the wines. Our management company is full-service. From site preparation to vineyard establishment and vineyard management, we have an attention to detail that results in first-rate vineyards. Our consulting and technology company is full-service. We can be engaged for a brief diagnostic visit, a defined project or an ongoing advisory arrangement. Vineyard moisture, mineral nutrition and pest/disease monitoring programs are offered. Moisture monitoring, weather stations and automation technologies are offered through our company and we provide full support and are backed by our manufacturing partners. Projects and pricing structures can be tailored to match your goals and your budget. Advanced Viticulture's principal viticulturist is Mark Greenspan, Ph.D.
Mark has over two decades of viticultural experience. His background includes a Masters degree in Horticulture/Viticulture and a Doctorate in Agricultural Engineering, both from the University of California, Davis. He is one of very few private practitioners who have been elected as an honorary member of Gamma Sigma Delta, the Agricultural Honor Society. He is regarded as one of the worlds leading experts in winegrape irrigation and has written scientific and trade journal articles on the subject. In addition to his command of grapevine irrigation practices, he has extensive experience in vineyard mineral nutrition, crop load management, vineyard uniformity, grape maturation, weather, climate and viticultural technologies. Mark holds certifications from the American Society of Agronomy as Certified Professional Agronomist (CPAg) and Certified Crop Advisor (CCA). He is also a licensed pest control advisor (PCA) in California (#131135). With a background in electronics engineering, coupled with mastery in viticulture, Mark is uniquely equipped to support the implementation of technology in the vineyard and does so through numerous corporate partnerships. He has frequently delivered presentations on numerous topics to his colleagues in the wine industry at venues ranging from small classrooms and vineyard tailgate meetings to large industry-wide symposia. Mark is a regular contributor to wine industry publications, including Practical Winery and Vineyard andWine Business Monthly. He has been contributing a monthly column on viticulture for Wine Business Monthly since 2005. Advanced Viticulture, Inc. may be engaged for specific, short-term project work, general, longer-term advisory services, or anything in-between. Mark Greenspan examining and discussing rooting patterns at the Sonoma County Water Agency's water conservation demonstration project field day in 2009. Decagon Leaf Porometer, used for measuring plant water status. Advanced Viticulture, LLC is a distributor for MorpH2O Water Management, the commercial outlet for Decagon products, including the ECH2O soil moisture measurement devices. New Advanced Viticulture soil moisture data node. Nodes are self-contained and deliver data via a cellular connetion to the internet. Other sensors may be added to the system to form a weather station, if desired. Aquacheck multi-level soil moisture probe. These may be connected to the Advanced Viticulture cellular data node for instant live measurements of soil moisture for precise irrigation scheduling. Mark Greenspan with a soil moisture cellular node. 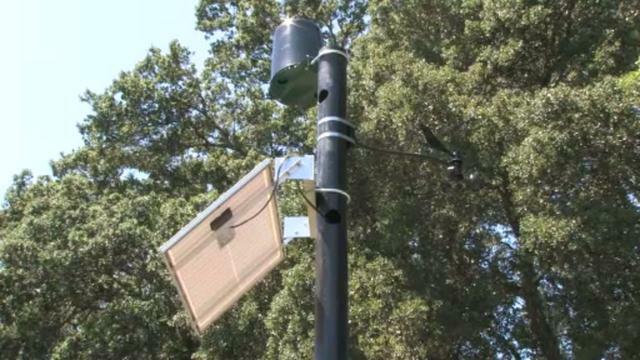 Nodes are self-contained, solar-powered and may be connected to one or more soil moisture sensors as well as other weather sensors. Insightful & Innovative Winegrowing consultation services. Learn about project director Mark Greenspan, Ph.D.'s vineyard water conservation project for the Russian River region. onoma County grape growers have been actively conserving water resources for many years. This video is meant to further educate growers on the different options to monitor the water needs and stress levels of the vine. Briefly discussed are visual indicators, moisture monitoring technology and the weather service tools provided to all Sonoma County and District 3 growers. Educator/Narrator: Mark Greenspan Ph.D., CCA, CPAg, of Advanced Viticulture, Inc. Length: 9:02 minutes. Using a winged-tine shank, this vineyard was ripped to break up wheel-track compaction. 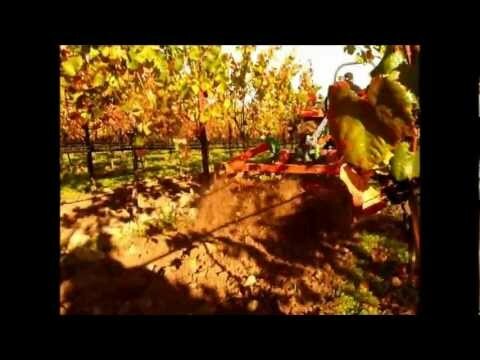 Using a Clemens soil conditioner (tiller) and seed drill, we prepare a vineyard for the winter. 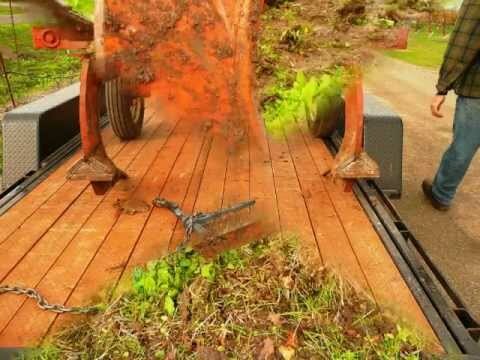 We will do custom work upon request. We want you to be prepared this spring so your vines wont end up looking like these. It's time to install a state-of-the-art wireless frost alert system.The systems we support will wake you from your slumber so you can brave the elements and protect your crop. Set specific parameters, choose your mode of alert, and trust that your system is acting as your frost sentry. Be alerted via phone call or text message or both. The AV team is ready to act fast and put in the necessary solutions ASAP. Email paul@advancedvit.com for questions and comments about frost monitoring systems. You can add a full weather station or any number of sensors and control elements to this system either now or in the future. Soil moisture sensors are the most useful tool for precision water management of vineyards. With two decades of experience, Mark Greenspan has perfected how to view these reports, and make calculated decisions about when to start irrigating and then about irrigation volume and intervals. We don't just sell soil moisture devices - we show you how to use them because we use them ourselves. Our services include installation and support of the soil moisture sensors. Once installed, we are happy to give a tutorial on how to view the soil moisture data and make calculated decisions on irrigation. For those wanting more assistance, AV offers an advisory package for folks looking for expert analysis and easy-to-follow irrigation recommendations based on your real-time soil moisture and plant stress data. Whether it is a short term tutorial, or long term consulting, we want you collecting soil moisture data and learning how to use it to extract maximum value. Email paul@advancedvit.com or call us at (707) 838-3805 for more information on our soil moisture probes and any site specific questions you may have. Who says the holidays have to be over? Now through the end of January, we are giving discounts on telemetry systems and sensors. Weather stations, soil probes, automation-you name it. This year we want to focus on connecting new and existing field sensors to telemetry. View historic data, set up alarms and even control valves and pumps from your smartphone or computer. Telemetry systems we currently support include Ranch Systems, WiseConn and Davis. These systems, including Aquacheck soil moisture probes are all discounted through the end of January. So contact us now! We are happy to discuss your current situation and find the system that fits your needs. Soil moisture sensors are one of the most (if not the most) useful tool for precisely managing water in winegrape vineyards. computer. Why wait to download the data when you can see what it is in real-time? your existing soil moisture probes. Costs vary, but you may be pleasantly surprised at how inexpensive it can be*. You have better things to do than download your soil moisture devices! * Advanced Viticulture's moisture monitoring clients may receive discounts on monitoring if telemetry is installed. or call us at (707) 838-3805. We are happy to discuss your situation and help find a solution to make viewing soil moisture data a whole lot easier. Monitoring water use may be necessary for some farms under SB88 or the SGMA program. Whether it is needed now or will be in the near future, why make more work for yourself than is necessary. Tracking water use of your vineyard/farm is cumbersome, not to mention the reporting that is needed. Many of us have flow meters installed (or may be required to do so in the near future). However, many are stuck walking the vineyard to collect flow data. We can help make that task much easier. Our technology partner Ranch Systems has introduced a package (for flow meters and pressure sensors only) where we can hook up existing meters to telemetry for 50% off annual Ranch Cloud subscription costs. The system can even generate the monthly report you need to file. New or existing meters, analog or digital at half-price. 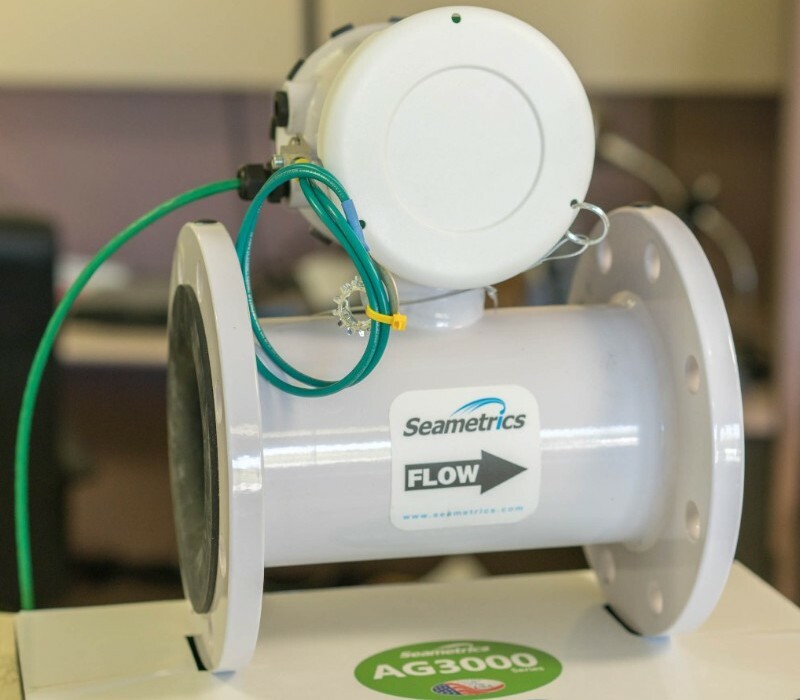 If you don't have a flow meter, we can help you get started on that also. As a general rule of thumb, most digital flow meters can hook right up to Ranch Systems nodes. We are happy to confirm this with your flow meter manufacturer. Shown in the photo right, connecting directly to the meter is a ranch systems sensor cable. New to Ranch is the optical reader for analog (dial) flow meters. The reader uses embedded camera technology to capture an image of the meter face at regular intervals, which will digitize the numerical value and create logs of water use and generate necessary reports under your control. We would be happy to help you track your water use for yourself or any agency. Avoid that hassle of doing it manually. Contact paul@advancedvit.com for any questions about this discount, or for all other vineyard monitoring technology. As July flies by, many of us on the North Coast have begun to irrigate, or will soon start the schedule. The timetable is calculated and undoubtedly, questions arise. Was pump x turned on/off? How long did Block x receive water? Was there enough pressure? Did the filter clog? ... Ease your mind during this critical time by installing a system that supports complete irrigation control. Systems we design, sell and support monitor and grant you full control of your vineyard irrigation. We work with some of the best companies out there for irrigation control: Ranch Systems and WiseConn. Click the logo below to learn more about each system and its specifications. We would be happy to go in to more detail about these systems, and discuss site-specific application to find out how best to suit your needs. Email paul@advancedvit.com or call us at (707) 838-3805. Water Stress Management: Do We Have It Figured Out? It doesn’t take a genius to know how important water is to agriculture, but 30 years ago I had yet to learn about the finer aspects of how it can be managed and manipulated to produce the best wines from any vineyard. I’m glad that I ended up working with water as it continues to be known as one of the primary tools a wine grower has available to manipulate his crop towards the end product and, for those of us in the coastal regions, to bring out the true site characteristics from a vineyard. I’ll divide the active growing season into four segments for the sake of this discussion: Budbreak to fruit set, fruit set to veraison, veraison to harvest and harvest to leaf drop. This stage is easy. Between budbreak and fruit set, we are aiming for steady, uniform shoot elongation. This period has been referred to as the “grand period of growth.” While we don’t want excessive rate of shoot elongation, we in wet winter climates usually manage vigor before the season starts, using balanced pruning techniques, not water management. We pretty much want our vines to have all the water they need during the grand period of growth. In the North Coast, this is easy. Even in drought years and except for the rockiest of soils, we usually start the growing season with a soil profile that is at field capacity and in some cases above field capacity at some soil depths. That is not the case with the Central Coast. Many locations will not receive a full profile from rainfall each year, so some irrigation will be necessary during the spring (and some will need irrigation during the winter as well). Finally, we absolutely do not want any water stress to occur on the vines during bloom and fruit set periods. We also do not want excessive vegetative vigor at this time, but that is often more about nitrogen status than water status. This is the critical period. Following fruit set, the berry enlarges, first by cell division and expansion and later (after two to three weeks have passed) by cell expansion alone. Berry enlargement will be very sensitive to water deficit stress at this time as the berry is being fed by xylem vessels, which can both push water into the berry and pull it back out. Growth of berries is impossible without turgor pressure within the cells, and water stress will cause berries to become less turgid. The softening usually only occurs temporarily during the day but can be sufficient to reduce berry enlargement. Therefore, water deficit stress has a direct, depressing effect on yield. However, the benefits of well-managed water stress at this stage are great, and this is the phenological period that benefits most from controlled water stress. As mentioned, berry size is reduced by water deficit stress. But, the benefits are not solely about berry size. Let’s get back to vine vegetative growth—primary shoot and lateral elongation. Our goal is to grow enough leaf area to ripen the crop but not so much growth, including lateral shoots, that we create a dense canopy, especially not in the fruit zone. Dense canopies cost more money in canopy management, create disease pressure, both for powdery mildew and botrytis, and have a depressing effect on wine quality. Vines that have ample water resources will simply continue to grow vegetatively, so there is a compelling reason to control water status of the vines during this phase of development. this is the lag phase when fruit slows down its growth prior to softening and resumes its growth at and after veraison. usually aim for -14 bars of midday leaf water potential or 125-150 mmol m-2 s-1 of stomatal conductance during this period, though these values vary among varieties, wine styles, and soil conditions. The current trend seems to be that the water stress applied prior to veraison can be relieved after veraison because beneficial effects of stress on berry metabolism is far less than before veraison. Aside from during heat events (when keeping water status high allows leaves to better cool themselves and maintain some photosynthesis) there is no reason to over-irrigate vines during the ripening phase. We want to maintain a little stress on the vines, though not as much as we had imposed on them during our lag phase stress window. Speaking of winemakers, it burns me (and sometimes the grapes) when they ask us growers not to irrigate during ripening or at least at the latter stages of ripening. 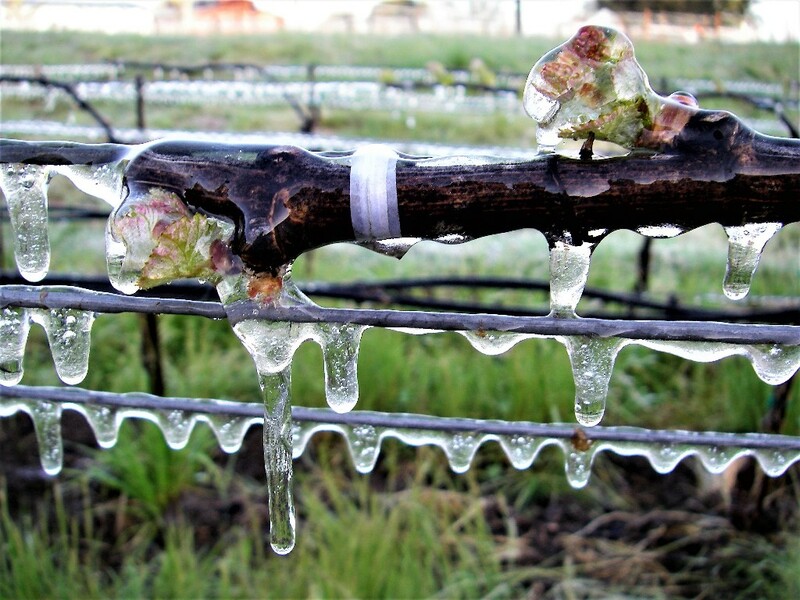 Unless vines have been over-irrigated, there is little reserve moisture in the soil remaining, and going cold turkey on irrigation causes vines in that condition to crash. I totally understand not wanting growers to over-irrigate at that stage, but vines still need water to maintain leaf function through harvest. Post-harvest irrigation is so important, it’s amazing how many growers get it wrong. I’ve seen everything, from no-irrigation after harvest to the infamous “big drink and walk away.” I’d prefer the latter to the former; but if the length of time between harvest and leaf drop is long, it’s better to just keep irrigating the vines as they were before harvest. We want to keep leaves functioning to replace carbohydrates in the permanent structure of the vine. This is extremely important. I’m not going to drone on and on about this, but the moment after harvest is the first day of the new growing season so don’t neglect your vines at this critical time. Check out Mark's full article in the May issue of Wine Business Monthly. Moisture monitoring of both plant and soil is essential for bringing out the best in any vineyard. Avoid excessive irrigation, find out if dry-farming is possible, bring out your vineyard's terroir and refine a key component of sustainable viticulture. Our moisture management services improve wine quality without sacrifice to productivity and, over time, reduce your vineyard's dependence on irrigation. We will install soil moisture probes in key locations that provide continuous measurements of the moisture profile and combine that with plant moisture status measurements and visual observations. You may have seen our soil moisture charts before (we post them here in our newsletters). We will interpret those for you, instructing you on how to interpret them yourself (if you want to), study them in the context of plant moisture status, and come up with brief, but specific, irrigation recommendations for you on a repeated weekly cycle. We do this for the entire growing season. Don't rely on a computer model or automated advisory system. Our hand-made advice comes from expert viticulturists with over three decades of combined experience including Mark Greenspan, Ph.D. who is known internationally for his work in vineyard water. We believe our services are best described HERE, by clients who have leveraged the results. Cost? Well like all things there are volume discounts, but our monitoring AND consulting services can be retained for under $50 per week per monitoring location for an entire season. Email Paul for questions and comments about the service, technology and specific application to your vineyard. Or call us at 707-838-3805. There have been some email campaigns circulating suggesting that irrigation of vineyards is imminent. For most locations, we disagree. Notwithstanding the predicted rainfall that should hit us very soon, most soil moisture profiles in the north coast are where they were last year. Using continuous soil moisture profile probes at our vineyards, we don't need to speculate about what might be needed with regard to irrigation. We just know. And no matter what method you choose to monitor your vine water status/stress and/or evapotranspiration, if you don't measure what is happening below the surface, you're still just guessing. Here we investigate a few different locations, with different soils and different climates and comment on each one. For each of them, we show a full year's worth of soil moisture. The beginning of the chart shows the moisture levels at the same time one year ago. The upper chart shows average soil moisture and the lower chart shows individual depths in the profile. Both representations of moisture are important as they tell us different things and facilitate rapid decision-making. Note that total profile charts are only possible with water content information - matric potential data cannot be summarized in this manner, which is why we prefer water content sensors. Do any of these look like your vineyard? You won't know until you measure it. Green valley vineyard on Goldridge fine sandy loam soil (we've used this site for examples previously). This vineyard has received about 22.5 inches of rainfall this season. The average soil moisture (upper chart, blue line) is nearly identical to what it was this same time last year. Note that the vineyard did not require irrigation until Mid-August as moisture was taken up at succesively-deeper levels as the season progressed. The longer we wait to irrigate here in the north coast, the less the vines become dependent on irrigation. Russian River valley vineyard on Huichica loam soil. This vineyard has received about 19 inches of rainfall this season. Again, the average soil moisture (upper chart, blue line) is nearly identical to what it was this same time last year. Note that the vineyard did not require irrigation until Mid-July as moisture was taken up at successively-deeper levels as the season progressed. The deepest level (48", brown line in the lower chart) did not get accessed by the vines until early August and moisture became depleted at that depth in early September. Eastern Paso Robles vineyard on a silty clay soil. This vineyard has received only 8.5 inches of rainfall this season, which is common, but on the dry side of normal. These soils rarely saturate and this season is no different in that respect. Note, however, that the soil moisture in the profile (upper chart, blue line) is about the same as it was the same time last year. In this climate, the limited soil moisture requires earlier irrigation to allow for canopy growth and good fruit set. After fruit set, irrigation must continue, but a deficit irrigation program will ease the vines into a mild water stress for the benefit of wine quality. Knowing soil moisture here is especially important at all times of the growing season, since it rarely starts off with a soil profile even close to field capacity. Soil water content information is critical, no matter how you choose to measure vine water status. You need to know what is going on below ground level. Don't guess - your crop is too important. Contact us to find out how you can start taking the guesswork out of water management. Contact Paul at paul@advancedvit.com or call us at 707-838-3805. Budbreak is here. And it's time to think about your water management practices this upcoming growing season. And for the lifetime of your vineyard. You would benefit by looking at the different aspects of your water use and management, and develop a plan to meet your needs, while using water as efficiently as possible. The irrigation efficiency tests would help you understand how well your system is working, and make recommendations to maximize your distribution uniformity and irrigation efficiency. This increases grape quality and production, while minimizing water use. The weekly Advanced Viticulture irrigation recommendations will help improve fruit quality and provide timely information on when to water or hold off. Fortunately, we can offer these services, of which you would only need to cover 15% of the overall costs. It would only require a small time commitment from you. Please let us know your interest in this, as we are trying to nail down our last couple participants soon. If you know of others you think would be a good candidate, please let us know. Frost season is upon us! Nights may have gotten warmer, but they will get colder again. Until mid-May, the North Coast runs risk of losing our crop to frost damage. There is still time to put the necessary measures in place to monitor frost events and reduce risk of catastrophic loss. The automated weather stations we install will wake you from your slumber so you can brave the elements and protect your crop. Systems we work with can automatically generate text messages and/or phone calls for frost alerts. Email paul@advancedvit.com for questions and comments about frost monitoring systems. We would be happy to send you more information, or set up a meeting to discuss applications specific to your farm. It's too early to tell, but recent weather history and February's forecast indicate the possibility of a dry winter. What does this mean to your vineyard? Will I need to irrigate early? Should I till my cover crop? It so happens that the rainfall we've received thus far has moistened the soil profile sufficiently to avoid the need for winter irrigation (in most vineyards in the North Coast), but prolonged lack of rainfall could change that. But the recent warm weather could promote early budbreak, which could introduce more variables. Email paul@advancedvit.com for questions and comments. We would be happy to send you more information, or set up a meeting to discuss benifits specific to your farm. We've been looking for an affordable telemetry solution for soil moisture monitoring. We have found it! The Davis Enviromonitor system is your simple, reliable and inexpensive tool for crop monitoring. Mesh network to monitor many locations across a property, inexpensively. Connect soil moisture probes, such as Aquacheck, who are also partners of AV. Telemetry nodes have an MSRP under $400 each and AV discounts ALL Davis Instruments equipment below MSRP. A great way to monitor everything in your vineyard. Advanced Viticulture is an authorized re-seller for Davis Instruments. Please join us at the Advanced Viticulture Offices on Friday November 17th from 10:00 to 11:30am for a USDA Natural Resources Conservation Service (NRCS) presentation on available technical and financial assistance for conservation work on vineyards through their Environmental Quality Incentives Program (EQIP). There are opportunities for qualified applicants of federal funding for vineyard projects available through the USDA NRCS Petaluma Field Office that demonstrate a conservation benefit. Projects often include (but are not limited to): irrigation system improvements, soil moisture monitoring, flow meters and weather station implementation, cover crop and mulching, wildlife boxes, hedgerow and insectary plantings, field borders and filters strips, and riparian area improvements.Fire recovery programs will also be discussed. Brooke Pippi, NRCS Petaluma Field Office Engineer, will be presenting this information and has 10 years experience with assisting growers in Sonoma and Marin counties.Keith Abeles from the Sonoma RCD will discuss programs and services that they offer to growers, in the realms of water management and fire damage support. We will also briefly discuss the PG&E ADR program, which will subsidize irrigation automation projects. Advanced Viticulture will be showcasing products from water management technology partners they represent, but this will not be a sales-focused discussion. Refreshments will be served. Please RSVP to Advanced Viticulture by November 14th to attend this exciting discussion and opportunity! No, we never get tired of promoting the use of soil moisture for vineyards. Having adopted them in 2010 after eschewing them for decades, we now feel that they are one of the most valuable pieces of information out there for growers. And they are becoming more affordable, at least with respect to the conveyance of this information to your computer screen, portable device or phone. We're working as re-sellers for several different companies now and you will be pleasantly surprised at the affordability as well as quality of these systems for soil moisture monitoring as well as any other monitoring or control purpose. Be pleasantly surprised. Call us at 707-838-3805 or reach out to Mark at mark@advancedvit.com or JT at JT@advancedvit.com. Oh, and by the way, those devices we installed in 2010 are still working just fine! Following a wet winter, how are we looking with regard to water management? This winter was the wettest on record. I've had some growers ask me or joke "so we won't need to irrigate this year, right!?". Well, as most of you probably know, that is not the case at all. There is a finite amount of water storage in our soils, referred to as water holding capacity (WHC), defined per depth of soil, but also spanning the depth of the effective root zone. Beyond that WHC, any additional moisture will either run off, or percolate below the root zone. Soils in the north coast were essentially at field capacity in December of 2016, so all of that heavy rainfall did not contribute one drop of additional moisture storage to vineyard soils. It's really the spring rainfall that dictates how we manage vineyard water. Late spring rainfall forces us to combat that extra available moisture through vineyard management practices, such as delayed suckering and thinning, cover crop and floor management, and possibly less fertilization. Next month, take a look at my article on the subject in the June issue of Wine Business Monthly, where I go into greater detail. In that article, I stress the importance of soil moisture management. There are new technologies that are bringing us the ability to automatically monitor vine water status (stress). I feel that some of the best are still to come, now being field-tested. We are participating in the testing of one of the devices and are also involved with another of them. Despite our increasing ability to monitor vine stress, the need for soil moisture monitoring is not reduced by any means. With knowledge of where root activity is occurring and where moisture continues to be available, soil moisture monitoring allows us to apply irrigation later into the growing season. Oftentimes, we've been able to dry farm vineyards previously irrigated. Also, continuous electronic soil moisture monitoring allows us to determine the depth of each irrigation and precisely how many days elapse for vines to extract that moisture. No modelling - just highly repeatable results from irrigation-to-irrigation and from season-to-season. I gave a presentation recently at the Sonoma County Winegrower's Sustainability Field Day. Check it out by clicking here. For more information about soil moisture monitoring, contact Mark at mark@advancedvit.com or JT at JT@advancedvit.com or 707-838-3805. 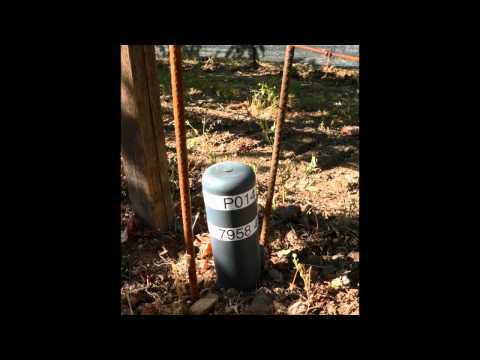 If your irrigation system uses an electric pump or pumps and is connected to a PG&E meter, you may be able to get your vineyard's irrigation system automated with a substantial portion paid by PG&E. 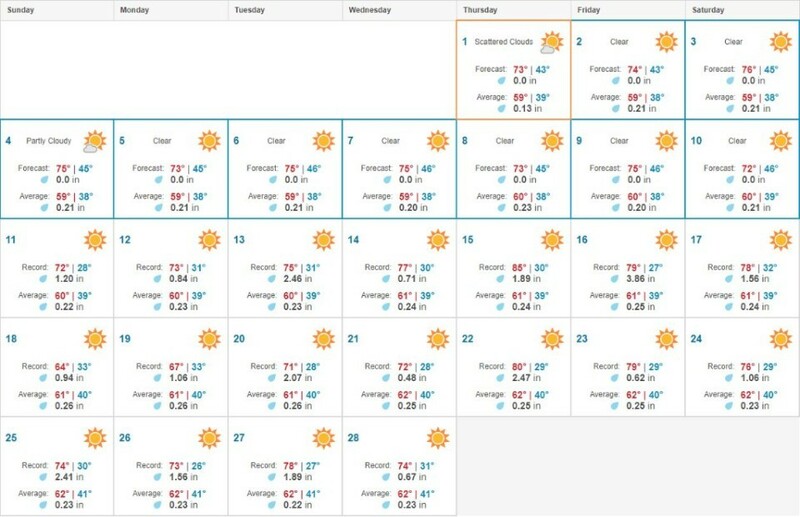 PG&E's automated demand response (ADR) program asks that a participating grower's pump be shut off from 1 to 5 hours during the peak demand portion of the day, for about 15 days during the growing season. Growers participating in the program get an initial payment to cover the costs (up to 75%) of an irrigation automation system which, in addition to automated valve control, may include soil and plant moisture, weather, and other monitoring features. Additionally, growers are paid cash or bill credits for each temporary pump control event. Growers are given advanced notice of these temporary downtime events. This is a great way to get a state-of-the-art irrigation automation and monitoring system installed in your vineyard at a fraction of its cost otherwise. We can help you with design and installation of a wireless system that requires essentially no disruption of your existing infrastructure. This is an exciting program. Get involved while it is still available! Application is very easy and requires minimal paperwork, with which we can help you. Inquire with Mark (mark@advancedvit.com) or JT (JT@advancedvit.com) or call us at 707-838-3805. A pest or disease outbreak can be devastating to your growing season, costing you up to a complete loss of crop. Keep an eye on your vineyard for pest and disease outbreaks. If you need assistance with that, we can provide it. Vineyard inspections, either weekly or bi-weekly, throughout the growing season, we will identify the problems when they are still easily treatable. We can potentially save you not only your crop, but your reputation as a wine grower. Talk to us about our pest and disease monitoring and insect trapping services. For more information, contact our PCA, Dan Vyenielo at dan@advancedvit.com or call us at 707-838-3805. 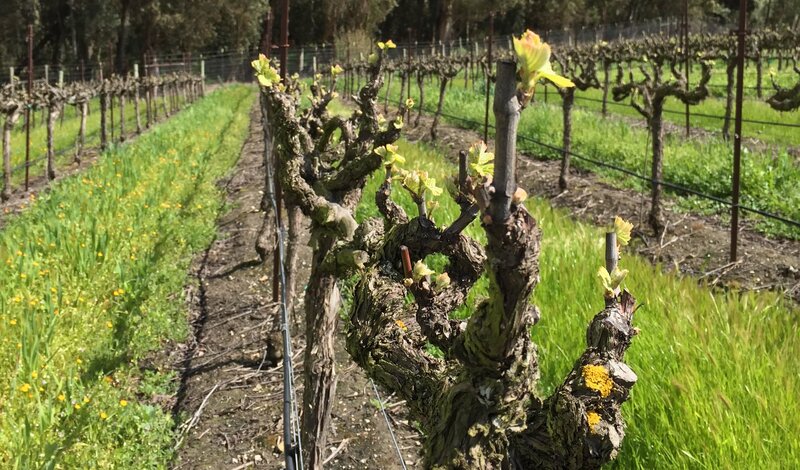 Springtime ushers in new hope for a great new vintage. As growers, we can only hope. But, we can also be proactive. As the vines wake up, their roots grow and reach out to explore and extract nutrients from the soil. Early-season fertilization will help some vineyards to achieve a full canopy with healthy, functional leaves. But, don't throw on fertilizers without some knowledge of the overall nutrient status of the vineyard, especially with regard to nitrogen. Excessive N fertilization or fertilization with N fertilizers to a vineyard that tends to be vigorous can be counterproductive. Take the advice of a good expert. You know who they are. Also, consider promoting the microbial diversity of your soils by applying a good-quality compost tea to your vineyard. Compost teas are active cultures of microbes, bacterial and fungal, which aid in the cycling of nutrients in the soil and allow for better uptake of nutrients to the vine. You can brew your own compost tea or call us and we can custom-brew a batch for you and provide it to you fresh for injection through your drip irrigation system. At around $3/gallon, it's an economical and impactful component of your sustainable soil and vine management tool set. For more information, please contact us at JT@advancedvit.com or 707-838-3805. Well, almost free. The Sonoma (Resource Conservation District) RCD has grant assistance funding available to work with a limited number of grape growers to conduct irrigation system evaluations in conjunction with soil and plant stress monitoring provided by Advanced Viticulture. The RCD is looking for interested candidates in the Mark West Creek, Mill Creek, Petaluma River, and Sonoma Creek watersheds. Please contact us if you are interested in this opportunity. Growers will be asked to contribute only 15% of the cost of the hardware and services.The grant funding will provide the balance of the cost. A great opportunity to get some valuable insight into your own moisture management practices if you are in one of the watersheds listed. If you are interested, please contact Keith Abeles at Sonoma RCD at kabeles@sonomarcd.org or 707-569-1448 extension 112. Or contact us at Advanced Viticulture, JT@advancedvit.com or 707-838-3805. If you are outside these watershed areas, give us a call anyway and we can discuss moisture monitoring and advising services for your vineyard too. To accomodate our growing services list and our increasing staff, we've moved our office to a larger space. Our new space has much more room for each of us, a full-size conference space, and a "lab" space where we can configure our field electronics before deployment in the field. We're all very excited! When Advanced Viticulture started almost 12 years ago, it was just me and a desk in the corner of my bedroom (and an ATV in the garage). Since that time, we've moved three times, increasing our office spaces and enlarging our equipment yard. We look forward to hosting meeting with our clients here. We're still at the same address; just at a different location within the complex. 930 Shiloh Road, Building 44, Suite E in Windsor (off of Shiloh Road). Hope to see you here soon! We Are Now Officially Certified Sustainable! Although we have always considered ourselves to be practitioners of sustainable viticultural practices, we felt it important to become certified sustainable under the California Code of Sustainable Winegrowing, administered by the California Sustainable Winegrowing Alliance. Sonoma County wine growers, led by the Sonoma County Winegrape Commission, are well on their way towards their goal of having 100% of their vineyards certified under this program. We are proud to be a part of this community of growers and just as proud to be complying with the California Code of Sustainable Winegrowing. We will continue to evaluate and upgrade our practices under this program. We're proud to announce that Advanced Viticulture was chosen as the "best" vineyard management company in the North Bay Businiess Journal's Wine Industry Awards ceremony, held on November 30, 2016 in Santa Rosa. We are grateful to our clients who nominated us for this award and are honored to have received it this time around. Our vineyard manager, Alec Roser and his team have done some great work in vineyard development and management and this award belongs to them. Click here for an article on our company that appeared in the North Bay Business Journal. The Unified Wine and Grape Symposium continues to be the largest wine and grape trade show and symposium in North America. As we have done for numerous years, we will be there on the exhibition floor, ready to greet our friends, colleagues and clients as well as meeting new people. To us, this symposium is the unofficial start of the new vintage. Come see us to talk to our viticultural team, including Mark Greenspan, our company President and former president of the American Society for Enology and Viticulture. Alec Roser will also be on hand to discuss the art of vineyard development and management. We continue to sell and support various water management technologies, including soil moisture, plant moisture, weather stations and irrigation control. We've now got some new technologies available and some even newer ones we are now evaluating. Talk to us about our brewed-to-order compost tea product, to improve your soil's health. Talk to us about viticultural consulting, for general viticulture, irrigation management and pest monitoring and control. We'll be in booth 314 on the main floor. We may have some free exhibit hall passes available - contact us if interested. We offer state-of-the-art pest and disease scouting services for vineyards. Our scouting service includes WEEKLY vineyard inspections from the beginning of the season through harvest, providing a high-intensity, high-frequency alert system for your vineyard. Don't let disease get ahead of you ever again! We have two PCAs on staff and we can also provide specific, independent, plant protection recommendations tailored to your vineyard and to the company where you typically buy your materials. Pricing starts around $50/acre for the whole year and varies depending on site. A great value for your vineyard in obtaining a set of trained eyes on your vines throughout the growing season. Contact us for a no obligation, no pressure quotation. Post-harvest is our slow season. Take advantage of it through discounts on moisture monitoring and control technologies! Post-harvest is our slow season. As much as we like reflecting on a great vintage where we helped growers and wineries improve their viticultural practices, installed and managed vineyards, and provided vineyard technology to many growers, we don't really want to slow down, even for a couple of months! We are offering discounts on our regular prices for many of the vineyard technology products that we represent. That includes Aquacheck soil moisture profile probes. These probes are among the best value in the realm of capacitance probes. Available in 4-sensor and 6-sensor formats, the per-sensor cost is similar to that of individual sensors, but these are integrated and fully-protected units. Available with internal dataloggers or with digital connections to dataloggers or weather station/telemetry devices, they have been essential to our work in vineyard water management. We continue to work with Ranch Systems, a Novato, California-based manufacturer of communications equipment. Much more than weather stations, these units will connect to the Aquacheck and other soil moisture devices, pressure and flow gauges, pond and tank depth sensors etc. They also can perform irrigation control, which is something most other weather station companies cannot do. New technology allows us to wirelessly connect these devices to a number of Aquacheck wireless soil probes, providing a low-cost way to develop a soil moisture sensor network without buying a bunch of expensive telemetry devices. Give us a call at 707.838.3805 or email jt@advancedvit.com or joe@advancedvit.comto discuss options and to provide you with a no-pressure quote. Discounts are available now through the end of 2016. The Russian Riverkeeper Board of Directors and staff have selected Mark Greenspan as the finalist for this year’s Business Water Conservation Award. The award will be presented at this year's River Awards Gala on September 24th. Mark was chosen because of all his work on vineyard irrigation efficiency and his 2012 Middle Reach Russian River Vineyard Irrigation Demonstration Project that provided valuable information on agronomic rates for irrigation with recycled water. These efforts help achieve one of the most important goals of achieving watershed resilience in the face of Climate Change by reducing water use and assisting with protecting high quality groundwater. Mark will be unable to attend the event, and the award will be accepted by one of Mark's associates. To quote Mark: "I would like to thank the Russian River Keepers for this honor. Our approach to precision water management provides for a very efficient use of water resources for wine grape growing. This benefits the grower in lower farming costs; benefits the winery in improved wine quality; and has the added benefit of water conservation. Grapevines are a very water-thrifty crop and we should be happy that they are a part of the landscape of this region." Mark will be travelling to Chile at that time at the request of some of the Chilean growers. Mark will be speaking to growers on vineyard irrigation management and on state-of-the-art vineyards in the north coast. Mark hopes to gain some knowledge and experience from the Chilean growers and maybe even get a Wine Business Monthly column out of it! The month of February was quite dry. In our soil moisture example site above (located in the heart of the Russian River Valley), only about 0.9" of rain were recorded during that month, though we are staring at more rainfall now that March has arrived. The soil moisture content charts (above) include individual levels (8" through 48" at 8" increments) in the lower chart while the upper chart shows average moisture content in the profile (all 6 sensors). We see that, in January, most levels were at saturation with the substantial rainfall that fell then (note how the curves "flat top"). The total/average profile moisture shows a similar pattern during January, where the relative moisture content hovered about 84%. We see how, since January, moisture content had dropped off by the end of February, breaking below saturation at most levels, including 40", though 48" still appears to be at saturation. The rains in early March brought moisture levels back to saturation, which will then drain off to be at field capacity. There was sufficient rainfall received in just those few days to bring the profile back to full, which is what we hope to have occurred by this time of year. With budbreak occurring, the dry February does not seem to have had any effect on the moisture conditions to start the season, thanks to the rainfall recently received. So, what will happen now? We'll keep monitoring. if you want to do similar moisture monitoring, let us know. We have new, low-cost ways to remotely sense soil moisture. Email us or call us at 707-838-3805. The growing season is upon us and with it comes weed and insect pests and diseases. We've crafted a program of intensive monitoring of vineyards, which will involve spatial mapping of problematic pests and diseases, identifying on maps where the problems are occurring, so they can be treated locally and monitored for effectiveness of the corrections. We can do weekly or bi-weekly scouting of your vineyards. In addition, we can do trap monitoring for important insect pests and vectors, and make specific, unbiased recommendations for control. This level of scouting and reporting is unprecedented and we are excited to bring it to growers in the region. Starting around $50/acre per year, it is also cost-effective. Email Dan, our PCA, or call us at 707-838-3805. A big step towards sustainability: Moisture monitoring services and irrigation guidance from an expert human viticulturist! Moisture monitoring of both plant and soil, is essential for bringing out the best in any vineyard. Avoid excessive irrigation, find out if dry-farming is possible, and make a big step towards sustainable viticulture. And don't forget that, with our moisture management services, wine quality is almost always improved without any loss in productivity. Water is our specialty. We can provide a full season of weekly plant and soil monitoring for as little as $400 per site per season. We can also provide specific irrigation guidance, from an expert viticulturist, not a computer model! Email us or call us at 707-838-3805. Advanced Viticulture recently sent out its first newsletter. In case you missed it, you can find it here: http://eepurl.com/byi4iD . The newsletters will offer some viticultural comments, usually from viticulturist Mark Greenspan, Ph.D., some updates on our company and occasional promotions, like the one we are running now on soil moisture probes. We'll be sending these out once per month, so please subscribe if you have not already: http://eepurl.com/bx90EH. Or email us and we will set you up. info@advancedvit.com. What can you do better next year for your vineyard? This is a great time to review your practices for the season, to see what you did well and what could be improved. Vines show a lot to a trained viticulturist at the end of the season. While our ongoing clients receive specific, proactive advice from us, its not too late to gain knowledge on how you can do things better going forward, maybe even starting this fall. Viticulturist Mark Greenspan can review your irrigation practices, nutrient and fertilization management, pest management, and general viticultural practices. An hour or two can make a huge difference for your vineyard gonig forward and may very well save you money on materials, improve productivity and quality, and help you achieve sustainability. Schedule a season-end checkup soon by calling 707-838-3805 or emailing mark@advancedvit.com. Advanced Viticulture's president, Mark Greenspan, has been appointed as President of the American Society for Enology and Viticulture (ASEV), after serving terms as director and 2nd and 1st Vice President. During his one year term as President, Mark hopes to attract more viticulturists and growers to ASEV membership. Mark says, "The ASEV is expanding its activities towards outreach to practitioners in the industry, including industry and outreach seminars at its annual conference, ongoing partnership in the Unified Wine & Grape Symposium and the brand new outreach journal, "Catalyst". This makes the society a fantastic conduit for knowledge from academia to the industry at large. For more information on ASEV membership, please go to asev.org. Advanced Viticulture turns 10 years old! On May 1st, Advanced Viticulture celebrates its 1st decade in business. 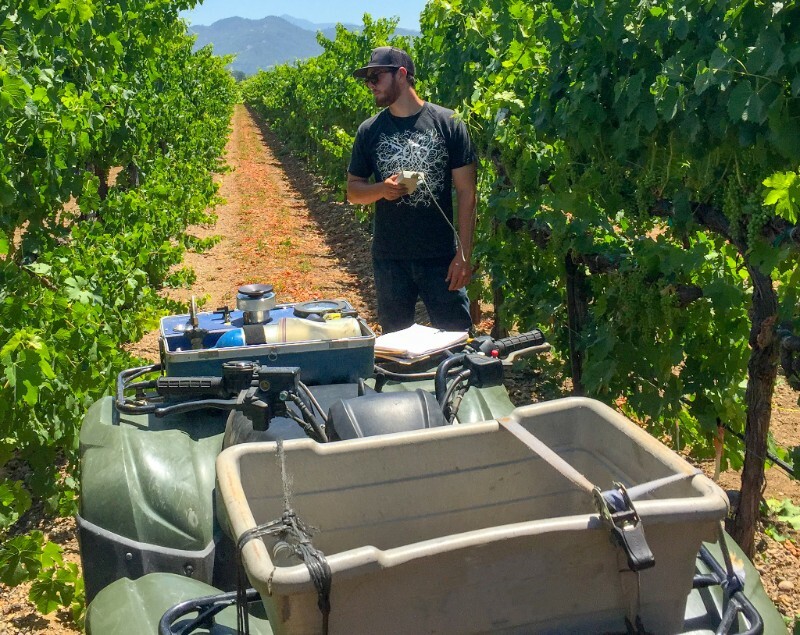 Starting out with Dr. Mark Greenspan as a one-man show, AV has grown to include additional experienced associates in the technical field and has moved with full force into vineyard development and vineyard management services. We are proud of what we do and also proud of the clients we serve. While growing, we remain committed to providing excellent, personalized service to our clients. Tell us happy birthday (no gifts please, it's the thought that counts) and we will extend a $100 discount on any number of Aquacheck soil moisture probes and will also extend discounts on any of the other products we work with, including Ranch Systems. This offer extends through the month of June, 2015. Please call us at 707-838-3805 or email Mark at mark@advancedvit.com. Contact us now. We have $100 off coupons for Aquacheck soil moisture probes. We also are offering discounts on Ranch Systems equipment through the end of February. And last, but not least, we have NEW low-cost cellular data soil moisture stations. Call us at 707-838-3805 for details or to set up a no-obligation, no-pressure site visit. We want to get more growers using technology for water savings. Face it, You're going to need it. Let us help you save some money. We are offering discounts on all of our equipment from now through the end of 2014. In addition, we can help guide you through the process of the government-sponsored programs that can contribute up to 50% of the cost of these products and their installation and even the consulting that goes into getting you up to speed on implementing and using this technology in your vineyards. Come see us at the Wine Industry Expo on December 4th. We'll be in booth 631. Or contact us at 707-838-3805. The Sonoma County Water Agency is sponsoring FREE soil and vine moisture monitoring by Advanced Viticulture, with weekly emailed commentary by viticulturist Mark Greenspan on irrigation practices. Most slots have been filled, but there is limited space still available. There is no catch, but the vineyard must be in the upper reach of the Russian River Basin (north of Healdsburg) and at least 10 planted acres. Call 707-838-3805 or email mark at mark@advancedvit.com to see if there is still room. Hurry! Mark Greenspan tells growers: "Your irrigation needs are probably less than you think"
Soils are dry. Should you irrigate? We're seeing dry soils in the upper 12-18" of soil, but most sites have plenty of moisture down deep. Don't guess! Measuring soil and plant moisture has been a game changer for numerous growers. Give it a try. We can rent you equipment if you aren't sure or have a constrained budget. Call us and find out how affordable moisture monitoring can be. We are getting calls for real-time monitoring of not only pond and tank levels, but also for monitoring well water levels. Water reserves are almost assuredly going to be lower than they have been in a while. While we have a full soil moisture profile to start off the season, how long will that last and how much reserve to you have? As your local reseller for Ranch Systems products, we are able to help you in multiple aspects of water monitoring. And while soil moisture monitoring is our specialty, we can integrate water level monitoring, flow monitoring and irrigation control into the system. Be prepared for what is coming down the pike. Don't wait. Give us a call at 707-838-3805 and we can discuss what is possible. Moisture profiles are filling in the North Coast! The much-anticipated rainfall has finally reached the north coast and we are watching soil moisture profiles fill to 3 and 4 foot depths at most locations and we expect additional rainfall to occur, further filling soil storage capacity and potentially allowing water movement into streams and reservoirs. The Central Coast remains dry and we hope that they will be blessed by rainfall soon. Whatever the case, and despite the current rainfall, water storgage will likely remain short in all regions. We can help you monitor stored soil moisture reserves and determine precisely if, when irrigation is necessary and how much to irrigate. Don't wait to gain access to this valuable information. We have rental and lease to own plans that will allow you to take advantage of these efficiency-gaining technologies this season while delaying the capital expense for later, or easily making small payments towards ownership of the equipment. This is a perfect time to have us install this equipment in your vineyard. Call us for a no-oblication, no-cost site visit. 707-838-3805. Drought is official, but don't break the bank to manage water. This may be a VERY challenging year for water management. We're hoping for substantial rainfall going forward, but it looks like a dry year is coming regardless. We have systems to help you manage your vineyard water that are extremely cost-competitive to some of the complicated, and expensive solutions being offered. We have over a quarter century of experience in vineyard water relations and management and can offer thoughtful and cost-effective ways to handle the challenges coming at us. Come see us at the Unified Symposium in booth 644 (main floor) so that we can discuss it with you. You may be surprised at how effectively you can manage vineyard water without breaking the bank. Drought? Do you know how to manage it? It sure looks like we may be in for a second very dry year, or so the long-term forecasts and recent history tell us. We certainly wish for wetter weather so that our soil profiles can fill up for the upcoming growing season. But that may not happen. What will you do? Water management is our strong suit, so consider our services to help you decide how to manage your vineyard water needs under any conditions - wet or dry. Soil and plant moisture monitoring, irrigation advisory, and other cultural practices support are all offered by Advanced Viticulture to help guide you through the season. Come see us at Dollars and $ense in Santa Rosa and at the Unified Symposium in Sacramento this month. Let us show you our soil moisture monitoring technologies and how we can provide cost-effective solutions for vineyards. A phone call costs you nothing, but doing nothing could be a big mistake! 707-838-3805. The best of both worlds! We manage vineyards too! Folks continue to be surprised when we tell them that we manage vineyards. Yes, we do! Advanced Viticulture started as a consulting and technology company and we still dedicate ourselves to those areas of service. But, we've been managing vineyards since 2011, marrying our technical expertise with solid, practical knowhow and strict attention to detail. The best of both worlds, our Vineyard Manager, Alec Roser, has a decade of experience. Taking guideance from Viticulturist Mark Greenspan, we feel we have a truly unique offering for our clients. Please contact us to discuss how we can service your vineyard next season. Or, come see us at the Wine Industry Expo in booth 146! Harvest is over, which means the 2014 vintage has begun. AV is still actively working. Mark will be making a presentation at the SITEVI International Exhibition in Monpellier, France. His topic will be irrigation management in California and the use of decision-support technology. This will be a great opportunity to explore new devices, machines and approaches being used in Europe and you can be sure to hear about some of them in his Wine Business Monthly column at some point. We've also been installing moisture monitoring, irrigation control and weather station equipment in the field. We would be excited to help you build a system that meets your needs and prepares you not only for the upcoming season, but for a future in which water use will be at the forefront of our sustainability efforts, our public relations, and our wine quality improvements. This is a great time to grab tax benefits of new equipment, and catch us before we get busy again with growing vines. Hope to speak with you soon! Need Vineyard Technology? Now is a great time to act! We hate limited time offeres as much as the next person, but there is good incentive to act right away if you are considering adding technology to your vineyard for irrigation or energy management. The NRCS' EQIP (Environmental Quality Incentives Program) deadline is November 15. Their program will cover nominally 1/2 the costs of your new equipment. Let us know if you are interested and we will connect you with the right person. The IRS section 179 allows a business to depreciate 100% of the costs of equipment during the year it was purchsed *. That's a huge tax incentive! Current limits are $500,000 for the year, but it is scheduled to drop to only $25,000 in 2014, unless a change is enacted to restore it. Another great incentive to furnish your operation with weather stations, irrigation monitoring, pump control, water level sensors, etc. On another note, let us remind you of the optioni to lease (to own) your new equipment. Advanced Viticulture has partnered with Paramount Financial Group to offer leasing packages for Weather Stations, Soil Moisture monitoring, and other vineyard monitoring and control technologies. Leasing provides the means to get your vineyard equipped with state-of-the-art technology without the need for a large outlay of capital. Several packages are available and most have a $1 buyout feature available, so that you will own the eqiupment at the end of the leasing period. The process is seamless and easy. Give us a call or email to inquire about the leasing options and we will guide you through the easy process. *Talk to your accountant about section 179 - we are not able to give tax advice. Register to attend an informational meeting on water conservation research findings and methods taking place in Alexander Valley. The information presented is from Western SARE grant research projects currently managed by Sonoma County Winegrape Commission in conjunction with Rhonda Smith, UCCE Viticulture Advisor, Mark Greenspan of Advanced Viticulture, and Tom Gore of CWUS/Simi Winery. Field day will include visits to two sites, where soil pits will be open to discuss issues affecting drip irrigation water percolation in vineyard soils.Discussions about frost protection as well. Lunch will be provided. Please RSVP. Are you getting behind on your vineyard operations? Let us help. This is the time of year growers seem to get behind: spraying, vine trimming, leaf removal and cluster thinning. Not to mention fertilization. We can help you get your work done on time. Give us a call and we'll see how we might be able to get you caught up. All with our usual strict attention to detail and professionalism. Call us at 707-838-3805! We are pleased to announce the addition of John Camastro to our team. John will be performing hand and mechanical tasks in our managed vineyards as well as supervising operations. John has a degre form the University of Washington School of Fisheries with a BS in fishery science. He has been involved with construction and has run his own excavating company prior to joining us. We look forward to having John help us to farm more vineyards with an eye toward attention to detail and true sustainability. Advanced Viticulture is excited to announce the addition of a new Viticulturist and Soil Scientist to our team: Joe Gallucci. Joe will bring a broad-based technical and practical perspective on viticulture to our company as well as solidifyiing our strengths in soils evaluations and our focus on sustainable viticulture. Joe has a BS in Geology and a Teaching Certificate from State University of New York and dual master's degrees in both Soils/Biogeochemisty and Horticulture/Viticulture from UC Davis. His extensive education is supplemented by practical experience, having held roles as viticulturist, vineyard manager, and winemaker. He has worked on the east and west coasts of the United States and has worked in numerous locations internationally. Needless to say, we are delighted to have Joe with us and believe strongly that he will help us to better serve our existing and future customers. Vineyard consulting and vineyard management taken from the standpoint of what is appropriate for YOU. Our goal is to help you create a product that provides value for you as a grower, you as a winemaker, or you as grower and winemaker. We never rubber stamp anything we do - everything is based on your needs, no matter if you are growing, buying, or both. The only thing constant is our attention to detail and committment to sustainable farming. We can do custom vineyard operations for you this year or manage your vineyard from A to Z. Call us for affordable, yet precise soil and plant moisture monitoring equipment and services. General or specific vineyard improvements? Mark Greenspan, Ph.D., CPAg, CCA, is eager to turn problems into solutions for our clients. No challenge is too great. Try us! Don't forget your vineyard soil. Detailed soils mapping allows us to diagnose issues in the vineyard and offer site-specific recommendations to correct problems and improve uniformity of maturation. Soils mapping provides detailed information and prescriptions for vineyard plantings and replant efforts. And soil moisture monitoring provides precise control of vine water status and provides for efficient water management, sometimes indicating no need for irrigation at all! New telemetry options are now becoming available, so talk to us about various options. Mark Greenspan, Ph.D., CPAg, CCA is eager to "get the word out" about how easy it is to realize immediate improvements to vineyards. The only vineyard management company with a built-in full-time, Ph.D.-level, ASA-certified vineyard consultant! ** We prefer not to think of us as vineyard "managers", but as a vineyard care organization. We take pride in all of our vineyard and winery clients, whether we're on hand for vineyard advice or operations, vineyard design or installation. Combining technical expertise with attention to detail, we are eager to work with clients who take pride in their product. Let us help you craft your vineyard. Please visit us at the Unified Wine and Grape Symposium (booth 939) to see what we're up to. Let us show you the tried and true best way to manage vineyard water needs and I'll bet we can improve upon your current practices. Hope to see you there! Please come talk with us. This is an important time in our business and we probably can help you out. Think water quality and conservation, nutrient management, vineyard management and vineyard installations. We have some new things to show you as well. We had some great discussions about general vineyard improvement, vineyard development and management, moisture monitoring and vine nutrition at the Napa Valley Vit Fair this week. We focus on all aspects of sustainable wine growing with an emphasis on detail. Thanks for stopping by! November through February are relatively slow months for us, and we generally get inundated with requests for soil moisture monitoring equipment in early spring. Help us to alleviate the backlong in spring and keep us busy during the winter. In return, we will reward you with 50% off of installation costs and package discounts on soil moisture monitoring equipment. We have hundreds of these soil monitoring systems in the ground and growers have completely changed their irrigation approach, often saving half of the water they had been applying prior to using them, while improving wine quality and vine health at the same time. Initial consultation and quotes are at no charge and with no sales pressure. Let us prove to you that your vineyard operation will benefit from these devices and save money at the same time! Vineyard operations getting behind? We can help you get caught up. Vineyard operations:Advanced Viticulture offers vineyard operations services. Call on us for custom operations, such as spraying, mid-row and in-row cultivation, mowing and vine trimming. We are a licensed pest control business and can help you get through the difficult period of disease management. We've recently added more equipment to expand our offerings. We operate witth efficiency, safety and sustainability in mind. Moisture management knowledge services:Some other vendors may sell you equipment to monitor soil and plant moisture, but may leave you alone to figure out how to actually USE the equipment. We sell soil and plant moisture monitoring equipment, but we also use the instruments in our own practice. We will get you started with the training necessary to fully utilize the power gained from monitoring soil and plant moisture status. We are busy installing soil moisture probes right now in the north and central coast regions, with clients excited about their potential to guide them in moisture management. Call us to find out how cost-effective, yet impactful these devices can be for you. We've also experienced growing interest in the leaf porometer, which provides meaningful information as to the physiological stress on the vine, and allows us to guide water management towards achieving the balance between excessive and insufficient vine stress. Call us to discuss at 707-838-3805, or contact us at info@advancedvit.com. Please come see Advanced Viticulture at the Napa Wine + Grape Expo on November 16, 2011 at the Napa Airport. We'll be in booth B8. We will be there to discuss soil and plant moisture monitoring, general viticultural consulting and vineyard management services. We look forward to seeing you there! Reduce your water footprint now while getting your vines into balance. Mark Greenspan will discuss methods of precision water management and irrigation at two seminars this Fall. A free webinar will be conducted online in conjunction with Ranch Systems on November 11, 2011 at 11:11 am (that's a lot of elevenses!). The free webinar will discuss soil-moisture methods for irrigation scheduling and will review some case studies from the 2011 season. Click HERE to register for the free webinar. Mark will also be speaking about vineayrd water management tools at the Napa County Water Conservation Workshop on December 1, 2011, which will be held in Yountville. Details forthcoming. Also, Mark will speak about practical uses of agricultural lab results to soil and plant analytical personnel at the Laboratory Analysis Workshop in Modesto on November 8th. Advanced Viticulture and Ranch Systems announce a new solution for soil moisture management and control. Partnering with AquaCheck Soil Moisture Management, Advanced Viticulture is packaging one or two soil moisture probes with a cellular-based data node as a stand-alone automated data collector. Data telemetry and management is powered by Ranch Systems, LLC's technology. Professional installaion is available. The focus on these automated soil moisture management systems is on irrigation and water management, but the equipment may be configured with other weather station devices as well. For more information, please contact Advanced Viticulture at 707-838-3805 or info@advancedvit.com. February, 2011:Advanced Viticulture is excited to announce the addition of Alec Roser to our staff. Alec brings years of experience in vineyard development and management to our company. He has developed premium vineyards throughout California. Alec will serve our clients in a technical viticulture capacity and will also enable us to expand our offerings into management of vineyards. January, 2011:Teaming with Meristem Technologies, Advanced Viticulture will be making real-time data available to clients via Advanced Vit's web site. The web portal will provide water status, soil moisture, observational reports, and other viticultural information to clients. Map-based as well! Components of service packages may be selected based on client's needs and budget. Pricing may be structured in the form of monthly service fees with no hourly constraints, as hourly service rates, or combinations thereof. Soil moisture monitoring equipment may be leased on its own or in conjunction with monitoring services. No capital up front! On a tight budget right now? Ask about a-la-carte services!
" We're pleased to have had the opportunity to work with Advanced Viticulture for the last 3 years. Mark and his team have rapidly exercised our technology in the field and provided us an authoritative assessment of feature strengths and relevance. " 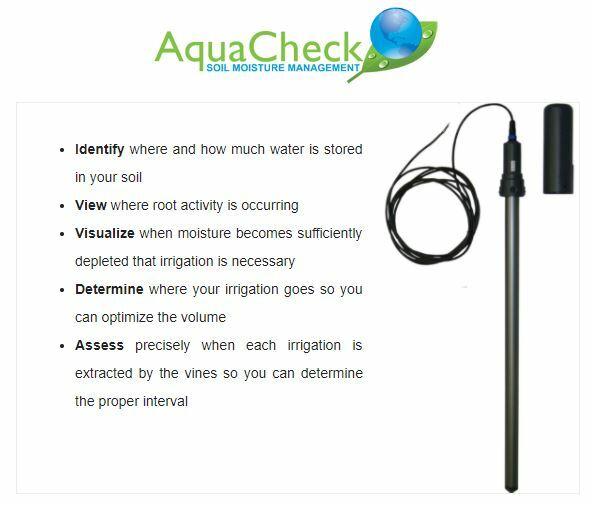 - ScanControl, Inc., ScanControl, Inc.
AquaCheck Soil Moisture Management - There are many soil moisture sensor manufacturers out there, and we have identified Aquacheck as being among the most reliable and affordable devices on the market. 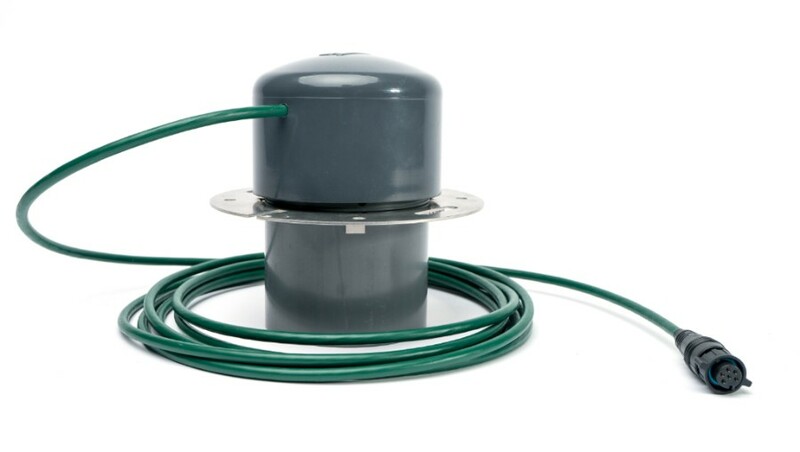 Building on capacitance technology, Aquacheck manufactures probes with 4 or 6 sensors built into a sealed unit, to provide sensitive and reliable soil moisture information for years. Advanced Viticulture is an authorized reseller and installer and we specialize in the installation of these devices even in tough, rocky soils. Ranch Systems - We have enjoyed a partnership with Ranch Systems longer than any other company. Headquartered in Novato, California, Ranch Systems manufactures weather stations and wireless vineyard control systems. 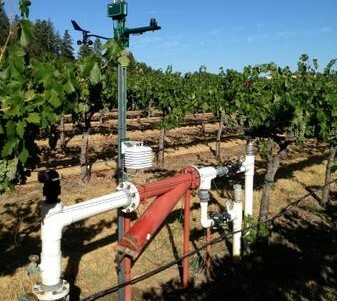 They can monitor soil moisture (connection to Aquacheck and other probes), irrigation system status, water depth, and local weather, while providing irrigation system automation for vineyards and other farms. Advanced Viticulture is an authorized reseller and installer, supporting all applications, and specializing in water management and control technologies. 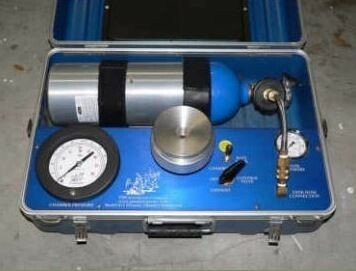 Davis Instruments- Based in Hayward, California, they are a manufacturer of weather station instruments and have been in business for over 50 years. Their new Enviromonitor system combines weather stations with other monitoring capabilities, not the least of which is connectivity to the Aquacheck soil moisture probes. Their system is very low cost and the online user interface is simple and clear. Advanced Viticulture is an authorized reseller and installer for Davis Instruments. WiseConn- Based in Chile, but with local offices in California, they manufacture wireless telemetry and control devices, specializing in wireless irrigation system control under their DropControl brand. They integrate soil moisture, valve and pump control, fertigation control and weather data into a sophisticated, but easy-to-use online control portal. Advanced Viticulture is an authorized reseller and installer for DropControl products. Trimble (formerly STI) - A technology provider, and this relationship is focused on soil-based spatial technologies (SIS) to create high-resolution spatial maps of soil properties. Advanced Viticulture is a reseller for this technology. Decagon Devices - Soil moisture monitoring and Plant water status measurement. 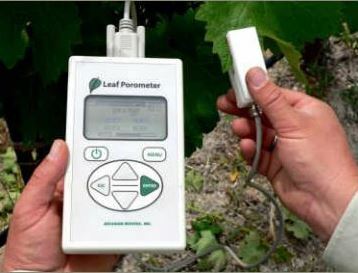 The Leaf Porometer remains the favorite plant-based moisture measurement tool. 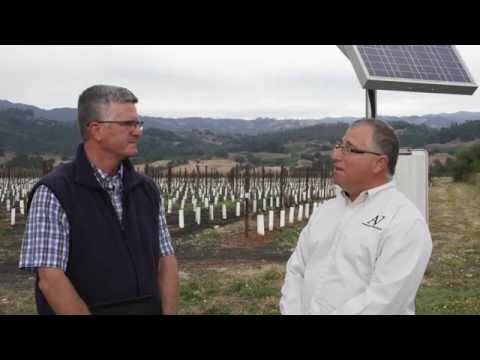 Advanced Viticulture is a Distributor of their products in Northern California. Partnering with several different vendors means that we will find the best solution for your situation and budget. We will not try to shoehorn you into a single solution. We will be available to help you integrate the technology into your operation, if desired. No pressure and no additional cost for equipment purchases. Equipment rental available for some equipment. "Mark is an important part of our team because he consistently produces results. His all around knowledge of climate, soil and viticulture has been invaluable to us. Especially at our most challenging sites." "We have been working with Advanced Viticulture, LLC for five years. We began working with Mark because we needed advice to bring our vineyard to a higher level of fruit quality and solve special plant/soil nutrient issues. We have found that Mark's advice on vine nutrition, plant moisture management and trellising has enabled us to improve the fruit quality to the level we were seeking. What we value most in our work with Mark is his deep and rigorous knowledge of viticulture research literature as well as his unique knowledge of the relationship between viticulture practices and results in the vineyard. It continues to amaze me how Mark can ride through the vineyards and visually identify plant nutrient issues and plant moisture status. He is a strong proponent of using detailed scientific data on plants to confirm visual observation of plant nutrition issues which is a practice that we now regard highly." "Advanced Viticulture has added value in making recommendations for operations that have resulted in improved vineyard health and increased production of high quality fruit. "I have had the pleasure of collaborating with Mark Greenspan, Ph.D over the years on numerous projects addressing different issues. In each situation his insights, advice and open-mindedness served us well. I would have no hesitation recommending his services and look forward to our ongoing collaborations." Advanced Viticulture has supplemented our company's technical viticulture effort for the last three years. Specifically, Advanced Viticulture has helped us with staff training, technology investigations, and viticulture research projects. Advanced Viticulture helps insure that Walsh will stay sharp and continue to provide excellent service to clients.